We've just turned a bit. The bridge is a post-war reconstruction of the city's first bridge, the so-called Chain Bridge of 1849. (The Germans blew all the bridges on their way out of town.) The dome belongs to St. Stephen's Church, named for Hungary's first Christian king (975-1038). 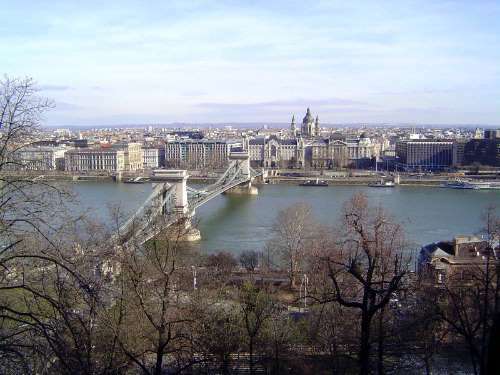 Baedeker, never in doubt, says of the district here and just upstream that "the finest part of the town on the left bank is that adjoining the Danube, with the House of Parliament and other handsome buildings." He especially praises "the Francis Joseph Quay (Ferencz-Jozsef Rakpart)." The name has changed, as have those of most things here of Germanic origin. Now it's the Pesti Also Rakpart, or Lower Pest rampart. See that building right at the end of the bridge?